line a shallow baking dish with foil piece large enough to later wrap chicken in. Cook 1 piece of diced bacon in small skillet. When cooked, add diced shallot and cook until soft. Add raisins and heat through. Add skillet mixture to cooked brown rice and barley, combine well. Gently stuff poussin with rice mixture, then wrap two slices of bacon around poussin, breast side up. I gently tied the bacon pieces in a knot, you may wish to use a toothpick to hold the ends together. Place bird breast side down in prepared dish. Toss chopped fresh vegetables with a bit of olive oil, and sprinkle around prepared bird. Place in oven, and roast for 45 minutes, stirring vegetables once during cooking time. After 45 minutes, wrap to cover entire contents with foil. Roast for an additional 15 minutes, or until clear juices run when thigh is pierced. While chicken is roasting, place fresh fruit juices in small saucepan, and boil for 15 minutes or longer, until juice is reduced by half and yields a lightweight sauce. lightly coat serving plates with citrus reduction sauce, reserving a little. Carefully split poussin in half, and place on sauce, cut-side down. Spoon roasted vegetables around chicken, and top entire serving if desired, with more citrus sauce. On the heels of our newsletter, and since Lisa and I just posted you on all the good gossip from our desks here at Melting Pot Food Tours, this week's story is going to just tempt you to prepare a meal you might soon consider irresistible! My friendly tour rounds at LA's Original Farmers Market include Julio's Farmers Market Poultry, because I can't seem to refrain from singing their praises. Their chicken reminds me of one I bought and cooked in Italy at a friend's home - so incredibly fresh, tender, and flavorful. My friends there at Julio's stall love to chat up sports, recipes, and what's new that they know I would just love. One day it was frog legs (I didn't love them and Andre' didn't mind my honesty; he doesn't like them either) and last week it was poussin. This too sounded French, so I was interested, yet again. 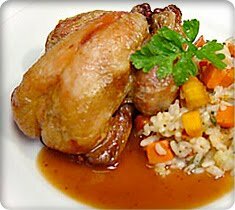 Poussin is a very young chicken which resembles a Cornish game hen. It is generally raised very carefully on select grains, to render delicious, tender, and succulent meat. They are specially bred to yield only a certain size and are harvested earlier than other varieties of chicken. The very pale meat is very low in fat and cholesterol, making it quite the healthy choice ... when you can get, and afford it. Julio is selling them fresh from the farm, for $5.49/lb. Each poussin are just over a pound and split, will serve two. So there I was, with my poussin and, a Brazilian recipe that I had discovered in the Brazilian magazine my friends at Pampas leave on their counter for those curious like myself. The recipe called for game hens, cornbread stuffing with prosciutto and cranberries, and papaya nectar. Let's see. I had a poussin, stuff to make brown rice and barley stuffing blended with bacon and raisins, and fresh oranges and limes were on my counter waiting patiently to be made into something fabulous. Voila! The following is my very yummy recipe (which leftover half I am enjoying for dinner tonight) and I am beyond pleased to report that everything except the olive oil, brown rice, and barley (pantry staples), were purchases from my favorite Market. The recipe was also inspired accordingly, and yields a myriad of colors, flavors, and textures that balance and compliment each other beautifully. For ingredients, I have indicated where you too, may buy the best groceries in town! You may also wish to drop by Breadworks for some kind of "mop"; you'll want to enjoy every last bit of what's left on the plate! Here is wishing you and yours a savory and sweet week, ideally with time around the table surrounded by those you love!